IN LOVE with everything about this setting spray. The packaging sold me instantly and then I actually used the product and fell even more in love. It sprays a fine mist, NOT harsh where you squeeze your eyes for the embrace and your whole face is soaking wet. \nAnd the smell is amazing!! Love, love, love will be buying again so I have a replacement when mine runs out. \nStaple product in my routine now!! Gina has rated on date 04/17/19 as Holy GrailIN LOVE with everything about this setting spray. The packaging sold me instantly and then I actually used the product and fell even more in love. It sprays a fine mist, NOT harsh where you squeeze your eyes for the embrace and your whole face is soaking wet. \nAnd the smell is amazing!! Love, love, love will be buying again so I have a replacement when mine runs out. \nStaple product in my routine now!! with 4.5star. IN LOVE with everything about this setting spray. The packaging sold me instantly and then I actually used the product and fell even more in love. It sprays a fine mist, NOT harsh where you squeeze your eyes for the embrace and your whole face is soaking wet. nAnd the smell is amazing!! Love, love, love will be buying again so I have a replacement when mine runs out. nStaple product in my routine now!! I\'ve tried many setting sprays and none are as great as this one. The smell is amazing and the finishing look is flawless! Samantha strickler has rated on date 03/18/19 as Best setting spray ever!I\'ve tried many setting sprays and none are as great as this one. The smell is amazing and the finishing look is flawless! with 4.5star. I've tried many setting sprays and none are as great as this one. The smell is amazing and the finishing look is flawless! Norvina nailed it! The smell is amazing and I like the Dewy look! The packaging is my fav! Paige has rated on date 03/16/19 as LoveNorvina nailed it! The smell is amazing and I like the Dewy look! The packaging is my fav! with 4.5star. Cielo German has rated on date 03/15/19 as Make upLove it with 4.5star. Athena has rated on date 03/15/19 as Love itSo beautiful my skin has this amazing glow and it helps to keep me hydrated with 4.5star. 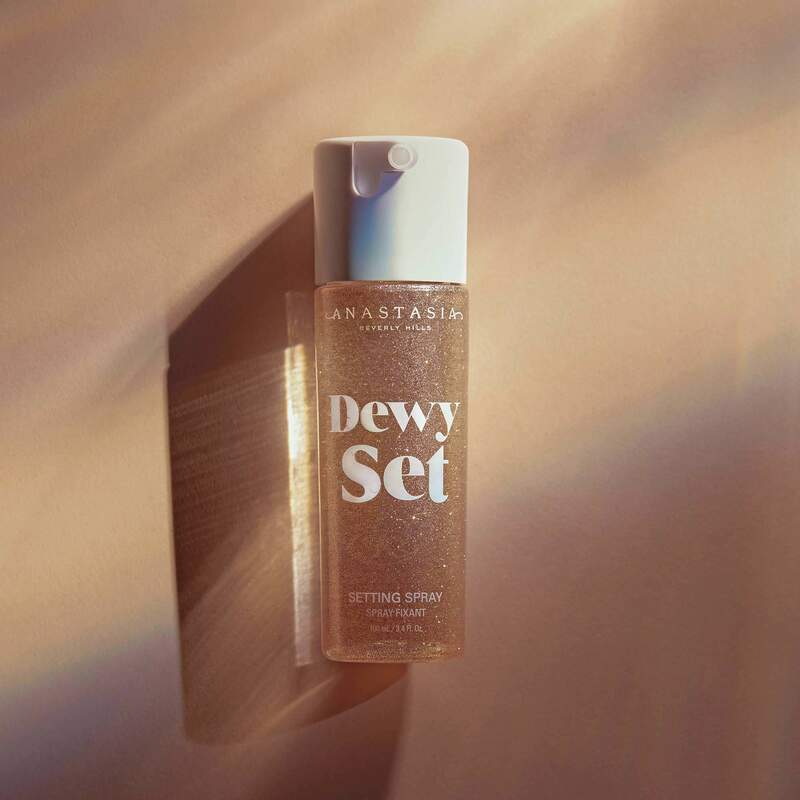 Anastasia Beverly Hills Dewy Set Setting Spray is a coconut-vanilla-scented setting spray that seamlessly blends products together as it sets makeup—leaving the complexion with a dewy (never oily), radiant finish. This gentle mist is ideal for those with dry skin or those who want to achieve the ultimate dewy glow. Comes in a glittery, pearl-white bottle. Formula is free of any glitter, sparkle or shimmer. Only packaging features decorative glitter element. Use Dewy Set to prep, fix or finish makeup throughout application. Apply to clean skin to prep or after makeup application to finish or refresh the complexion. Mist face in a “T” and “X” formation. Keep out of eyes.